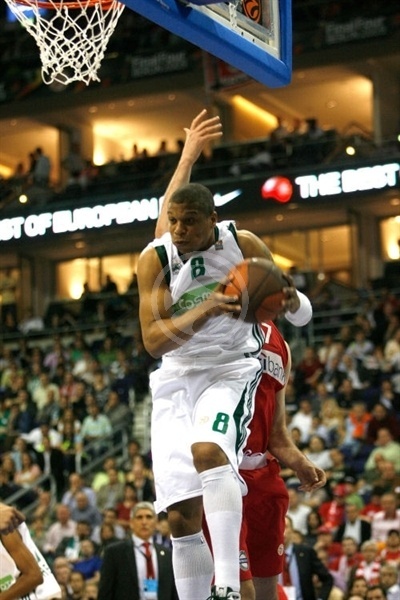 Panathinaikos bested archrival Olympiacos Piraeus 82-84 in a memorable second semifinal of the 2009 Euroleague Basketball Final Four on Friday evening at the o2 World in Berlin. 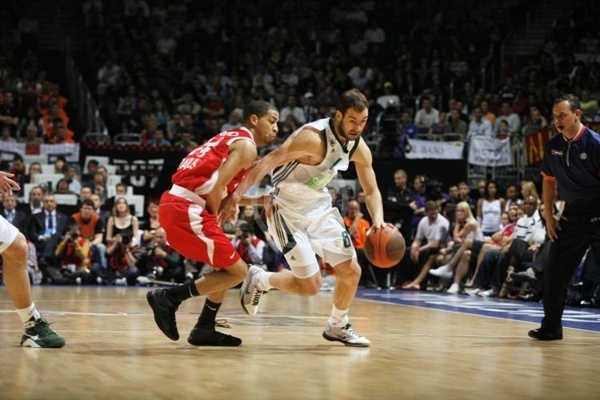 The Greens advance to face defending champion CSKA Moscow in a rematch of the 2007 title game on Sunday. 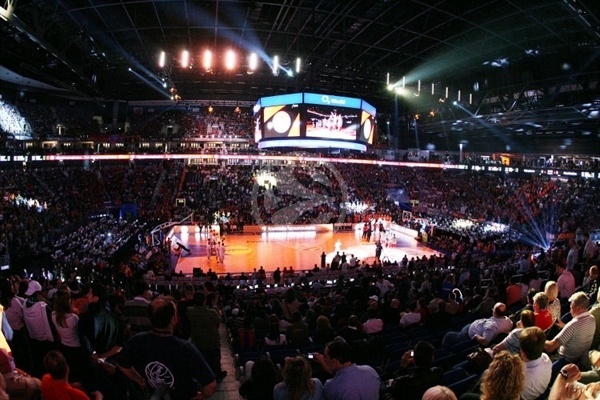 Panathinaikos edged CSKA for the crown that season in Athens. In front of an electric crowd, the game lived up to all its billing and came down to the final shot. But Ioannis Bourousis missed in the final seconds and Josh Childress couldn’t hit the follow-up as the Greens celebrated a big win. Panathinaikos enjoyed a well-balanced attack led by Nikola Pekovic with 20 points. 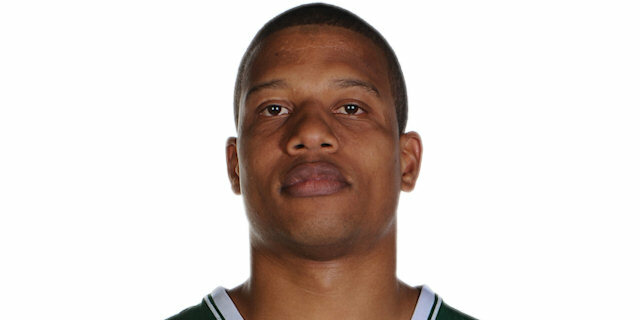 Mike Batiste added 19, while Vassilis Spanoulis and Sarunas Jasikevicius netted 18 apiece. 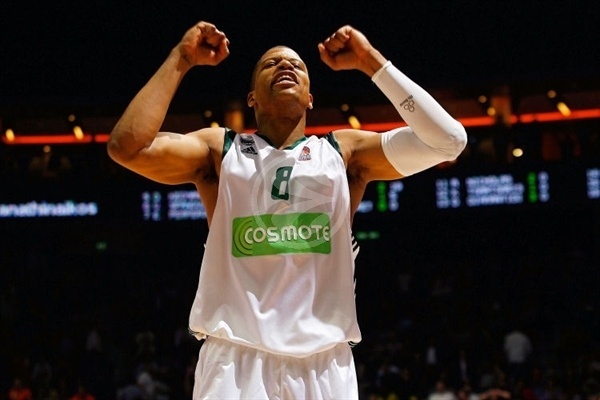 On Sunday Panathinaikos will aim to lift its fifth Euroleague crown, which would place it in a tie for the third most in the Euroleague. 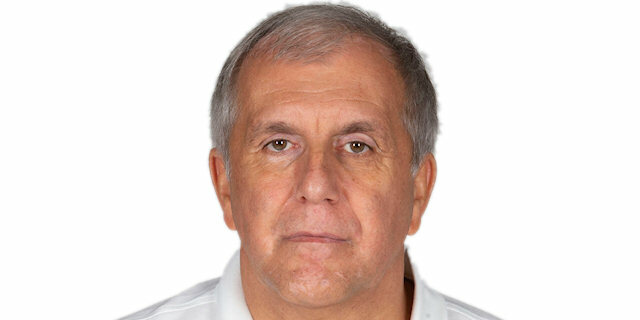 Zeljko Obradovic, the winningest head coach in Euroleague history, will target a record seventh title; team captain Fragiskos Alvertis will try for his fifth Euroleague championship, tying him for the second most ever; while Sarunas Jasikevicius tries to become the first player to win the Euroleague with three different teams. Meanwhile Olympiacos, which will face Regal FC Barcelona in the third-place game, got 18 points from Lynn Greer, 14 from Nikola Vujcic, 11 from Childress and 10 from Bourousis. Olympiacos won the opening tip, but it was Panathinaikos that struck first through Stratos Perperoglou, who scored in front of Childress and on the break thanks to a dish from Drew Nicholas. Pekovic muscled his way through Vujcic for a basket-plus-foul that gave the Greens a 0-7 lead. Vujcic finally got the Reds on the board with a hook shot and after Pekovic added to his tally inside, Childress set up Georgios Printezis for a three-point play. Childrss narrowed the gap to 2 with a layup in transition, but Panathinaikos capitalized on the fast pace through Spanoulis, whose basket and free throws on successive possessions made it 7-13. Yotam Halperin drove the lane for a basket. Panathinaikos continued to look for Pekovic inside and it worked. Theo Papaloukas came in and drove directly to the hoop, but Spanoulis beat him for a basket at the other end. A Batiste follow-up slam charged the already supped-up Green crowd. Both coaches substituted freely with only three starters still on the floor at the four-minute mark. Greer converted three the hard way and then drilled one from downtown to bring the Reds within 3. Free throws by Childress and then Bourousis further closed the gap, however Jasikevicius made a pair of free throws and Spanoulis drilled a three to give him 11 first-quarter points and Panathinaikos a 21-27 lead after 10 minutes. Zoran Erceg started the second quarter with a three. Pekovic scored inside again, but soon picked up his second foul. Still he punished the Reds with a pair of baskets, a foul from Bourousis and 2 free throws to make it 28-35. Papaloukas and Batiste traded scores as the pace quickened with both teams using three-guard lineups. Greer heated up with a basket and a triple. Even after a timeout, he came through with a floater to narrow the gap to 37-39. The Greens brought Pekovic back in, but failed to get him the ball. A stutter move from Papaloukas helped him get in for a layup to tie the game for the first time, 39-39. 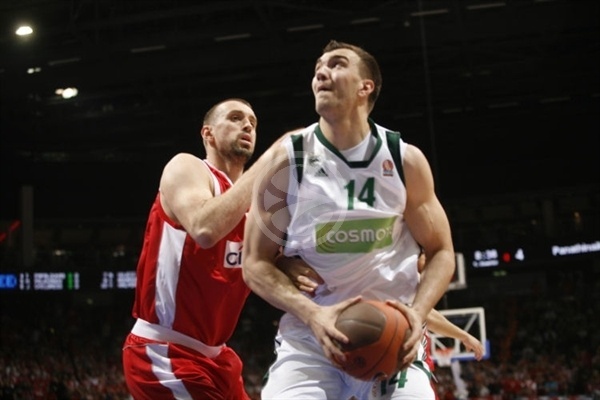 Spanoulis’s first points of the second quarter put the Greens back on top. Printezis tied it again inside before Antonis Fotsis’s lucky backwards tip-in beat the shot-clock buzzer. Halperin missed a long three on the last possession before halftime as Panathinaikos took a 41-43 lead into the locker rooms. The Reds came out for the second half and quickly tied the score for the third time on a brilliant Papaloukas dish to Printezis. 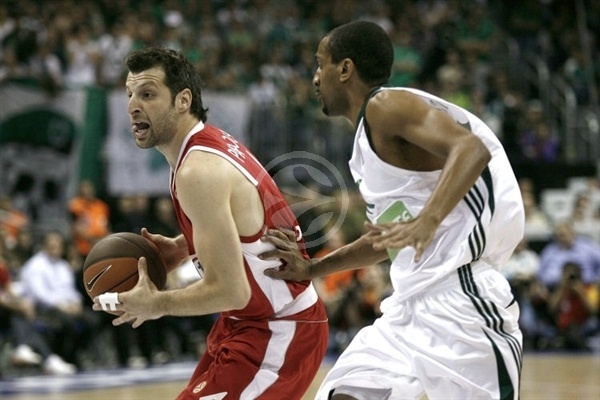 Olympiacos’s first lead came when Greer fed Vujcic off the pick-and-roll for a three-point play. Spanoulis and Pekovic restored Panathinaikos’s lead and Fotsis frilled a three to cap a 0-7 run. Vujcic beat the Green defense to the hoop and then scored after a tough drive by Printezis to knot the game at 50-50. Every possession took on a life of its own in a game certainly worthy of a Final Four semifinal. Childress brought out the best of the Olympiacos fans with an acrobatic drive and layup and Papaloukas fed Vujcic to put his team up 4. 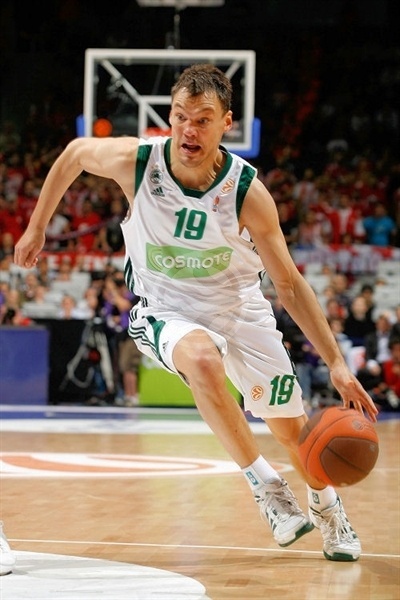 Panathiaikos came right back with Jasikevicius free throws and then tied the game on a Batiste slam. Childress and Batiste then traded remarkable athletic feats, the former scoring on a ridiculous follow-up dunk and the latter throwing down a powerful alley-oop. The score was still tied after Milos Teodosic and Jasikevicius traded threes. 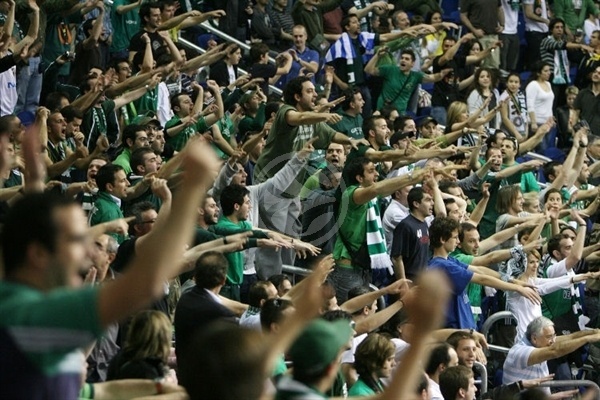 A second Saras triple followed by an Olympiacos 24-second violation gave the Greens a cushion. Batiste stretched it with a bucket in the paint and nearly made it stand with a block at the other end, however a Bourousis three made it 63-66 heading into the fourth quarter. 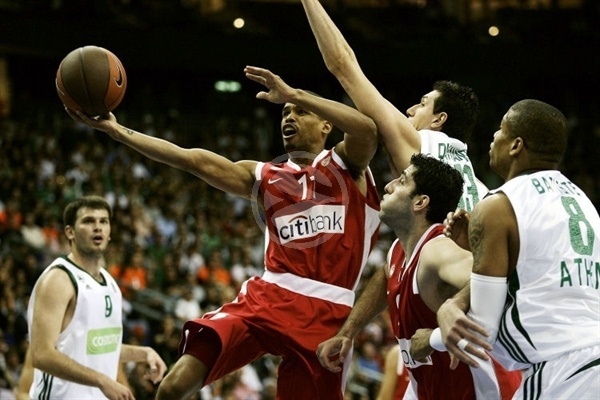 Halperin dished to Childress to bring Olympiacos within 1 as the drama grew. Batiste threw down another monster slam, the Reds lost a possession due to the 24-second clock and Batiste made it 65-70 from the line. Dimitris Diamantidis found Jasikevicius from the floor and he struck again from downtown and pranced down the floor as the Greens went up 8. An Olympiacos timeout helped the Reds reset and narrow the gap through free throws by Halperin and a Vujcic jumper. Printezis further cut the lead before Spanoulis stepped up with a three to make it 71-76 with five-and-a-half minutes remaining. Greer kept Olympiacos in the hunt with 3 free throws, but Saras roared through the lane for a layup. 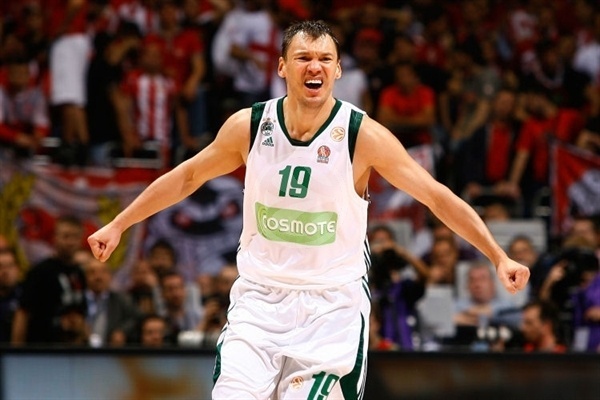 After Vujcic missed from close range, Jasikevicius looked to seal the win with a three-pointer. 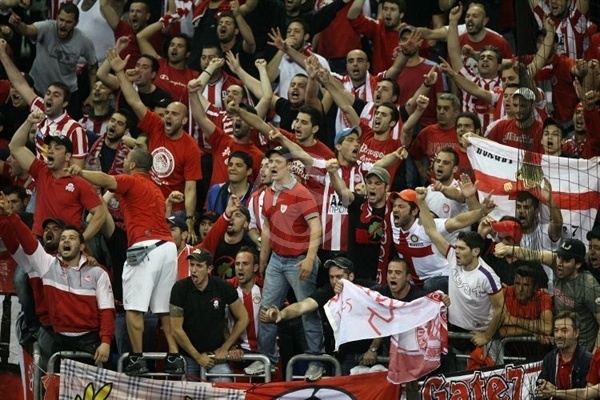 But Bourousis inside and Papaloukas from downtown pulled Olympiacos back to 79-81 with 2:05 on the clock. The Greens used a timeout, but the momentum remained with the Reds as Vujcic drew Pekovic’s fourth foul and closed the deficit to a single point. At the other end, Pekovic drew Vujcic’s fourth foul and made 1 from the line as well. Bourousis tied the game at 82-82 with 1:12 to go only to see Pekovic score at the other end. Vujcic missed a three, but when Pekovic’s shot rolled out, the Reds had the ball for the last possession. But when Bourousis’s shot bounced out and the tip by Childress went over, the Greens were able to celebrate a memorable victory and berth in the title game. "Good evening. I think that we showed a very hard and interesting game. Both teams tried to win until that the last seconds. My team tried to control the game in different ways. We had some success, but some details and some easy baskets from Panathinaikos kept us from the opportunity to play the final. I think we fought hard. I want to congratulate my players, but I think that if we had a little more concentration, we could have had a different result." "In a game like this, you try to have the basket go down in the easiest possible way. Our team likes playing hard games with tough opponents. It's not problem if it lasts 40, 45, 50 or 60 minutes. We tried to find the best possible solution. We could have come up with a better one, though." "I think that we actually had a lot of layups scored against us that we could have avoided. We were very impatient, I believe, and anxious to get to a big victory for our team. So I think we were a bit impatient." "Good evening. Before the game, in the last press conference, I said that every game between us and Olympiacos is a special game. I really believe that today's game was a special game in every sense. I think anyone who loves basketball enjoyed it very much. This is something the Euroleague needs, games like this one today. I want to congratulate my players for a great victory, but also to congratulate Olympiacos for the way the played and fought. I am also happy to see all of Europe watch this game. You must understand that between us - the players, the coaches, the staffs - everything is correct. And I am happy for this. A game like this is decided by small details. For Olympiacos, the last offense was unlucky. And we were lucky that Pekovic scored on our last offense. Balls go in or out of the rim, I don't know how. This was a game that in many moments we played good. I saw many good things, but we had some incredible turnovers, too. Leading by 8 points in the final quarter and with our experience, we must play smarter. We made those turnovers and allowed some easy shots that Olympiacos scored, but in the final on Sunday, it will be important not to do that. 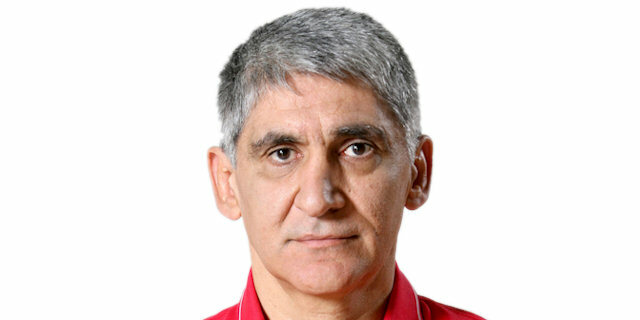 One more time, congratulations on a great game to my players and Olympiacos." "We were where we wanted to be. We played well and it came down to the wire. Maybe we should have attacked their guards more, but that’s water under the bridge now. We played hard and we had our chances. The game came down to a seven-footer in the lane. That’s a good shot, but it didn’t go in. I tried to get the tip up, but I hit it too hard. We’ll be back in two days because we have pride and want to finish the season strong. [Barcelona] is a team that likes to get up-and-down and we’ll be ready." "We didn´t play our best game today. There are still some minor things that we need to improve, and we´ll try to do that on Sunday night. We played a lot of big games against Olympiacos in the last years and this one was another great game on the line. The fans created a great atmosphere and it was great to be in such game. Now on Sunday we play the finals against CSKA like two years ago in 2007. It´s going to be another great game. I´m sure they will come with big motivation to win and get back at us for last time, but we´re ready for the challenge. We want to show everyone that we´re number one again."